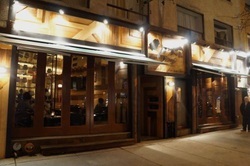 Our year-end party is taking place December 13, 7pm, at Sake Bar Kushi, near Yonge and Eglinton (http://www.sakebarkushi.ca/). I've reserved the zashiki room and I'm currently taking reservations. We will do set menu A, which is $29 (menu here:http://www.sakebarkushi.ca/menus/zashiki-party-room/), so with tax and mandatory 18% gratuity for being a large group, the total is just shy of $40. To make things easier for the hostess, she will collect $40 from everyone when they arrive, and then individuals will cover extras if they order them, separately (like sake, or favourite menu items). Plus one's are okay as the room has space for 50 people. I just need to know how many people would be attending. Please email toronto.kimono AT gmail.com with Bonenkai in the subject line, and please include your name and how many will be attending with you. Deadline to RSVP is December 5, so I have one week to tell them how many people will attend. Late notice, but Thursday, May 22, at 6:30pm will be a lecture by one of our members on Kimono & Colour as part of The Colour Research Society of Canada's series celebrating Asian Heritage Month. You can find more information at the Japan Foundation website, here, where you can also RSVP. TKC members will be in attendance as models and presenters for this evening. Hope to meet some of you there! Welcome to our new look! It's time we updated to a more modern aesthetic. Watch this space for information for upcoming events. We'll still have event pages on Facebook in our group, but in case you're not on facebook you can watch this space. The fb group is a closed group, but all you have to do is apply to join and a moderator can approve you. Our next event is rakugo by Katsura Sunshine at the Winter Garden Theatre on October 5th. There are some tickets remaining. We're going to do dinner beforehand, but don't yet have a destination, so if you've suggestions (and want to join just for dinner), check out the facebook event entry or email us and let us know! Here's to a bright future filled with kimono for us all!